Discussion in 'Recent News' started by Fyrinlight, Jan 12, 2018. Weeks are very long here in Mystian Network's headquarters. FOBs have been introduced to the server to spice combat up. One of the main flaws we found with combat is if you are the attacking group and a member of your party dies, they have to make a trek from their city back to the front line, meaning a kill of an attacker greatly outmatches a kill of a defender. In order to counteract this, we have made a system where you can set up a FOB for your alliance to spawn on. After your first successful capture of a tower, you can pay to have it turn into a FOB. There is a one off fee of 500,000 coins to make that captured tower a base, but trust me in saying it will probably be the most important point in the war. We have finally come up with a system for how rebellions will work. City rebels may not take anything except the armor they wear. City rebels may not have pre planned a rebellion, such as moving gear, blocking off ships, etc. If this is found the rebellion will be cancelled. Any sabotage before the rebellion is announced and started will be considered empire griefing. City rebellions require at least one sponsor nation. They also require that they start with demands, and if the demands are not met then the rebellion can start. The sponsor nation will get the citizens of the city, and they will be directly declaring war on the empire. From here, one territory tower will be chosen by staff to be the starting point of the rebellion, with victory ending with the claiming of the city. Vassal rebellions are a bit different than the city ones. They too start with a demands declaration, but they get to keep their city, and one territory tower. They must fight until their demands are met. If an empire is having multiple rebellions, all parties are set to war status with each other. A nation can only support one rebellion at a time. We have added a way to spread your thoughts and ideas throughout Mysto! If you are a prime user, simply hold a piece of paper in your hand and type "/propaganda MESSAGE". You will then have a piece of paper named whatever you want. Please note regular server rules apply. The world was peaceful after the removal of the last set of mass destruction weapons... now... we have re introduced them... what have we done!? A gauss cannon is a new cannon type that can only fire one devastating shot directly downwards. It cannot aim nor load any other shot. A gauss cannon is very expensive to build, and is very large compared to the other cannons seen in the game. The shot is a single emerald block. 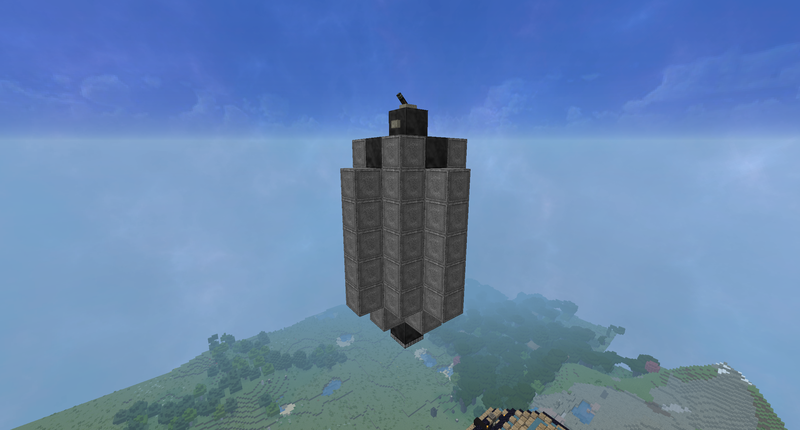 This block has the penetration power to push through 3 layers of obsidian, will leave behind 30 seconds of lingering poison and slowness in a 10 block radius, and is incendiary with a range of up to 50 blocks. To top this all off, it leaves a crater big enough to live in. Here are some pictures on how to build the gauss cannon. note on the construction: there is a lever on top, followed by a button on the side of the top coal block. There is also, instead of a trapdoor on the bottom, a button. Ares is the new type of airship capable of carrying this new Gauss Cannon. 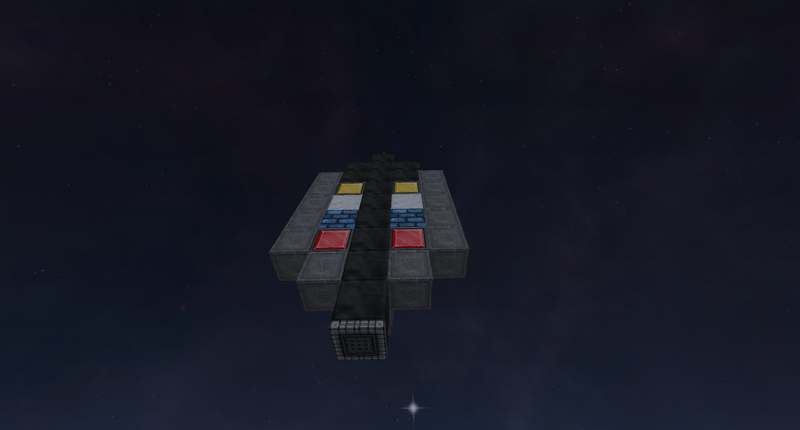 Ares require 1-2% redstone blocks, must be between the sizes of 4001 blocks and 6000 blocks, and may not have AA turrets on them (They have the allowed blocks to carry them, but are not allowed to have them by server rules.). Fixed an issue where torpedoes and bombs would only explode if travelling eastward. All ship types can now transport animals. Territory Towers in oceans will now spawn ink rather than fish. Capital city chunk capture time is now multiplied by the number of other cities still uncaptured. City chunk capture time is now multiplied by the number of adjacent and diagonal chunks still belonging to the defender, including the chunk under attack, divided by 5. Added /d chkr command that allows you to check the relationship status between two empires. If only one empire is given, it checks the relationship status of the other empire towards your own. Fixed a typo in the mines. Coding platforms do not have spellch3cks. Cities can now have more than one home portal. Most cities now have a train connecting them to the rest of the world. All tickets are now sold for 2,500 coins at the ticket NPC's. Signs now state when the next train will be arriving. Removed the ability for wizards to help in blacksmithing.